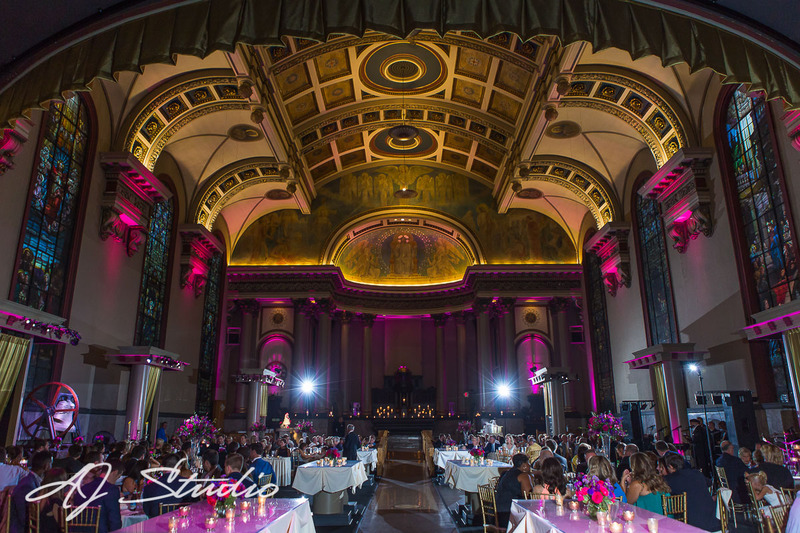 Restored from the beautiful Old St. Paul’s Church, the Bell Event Centre creates an elegant ambience with plenty of history and character everywhere you look. The wedding staff have been known to go above and beyond to help brides and grooms enjoy their wedding day. 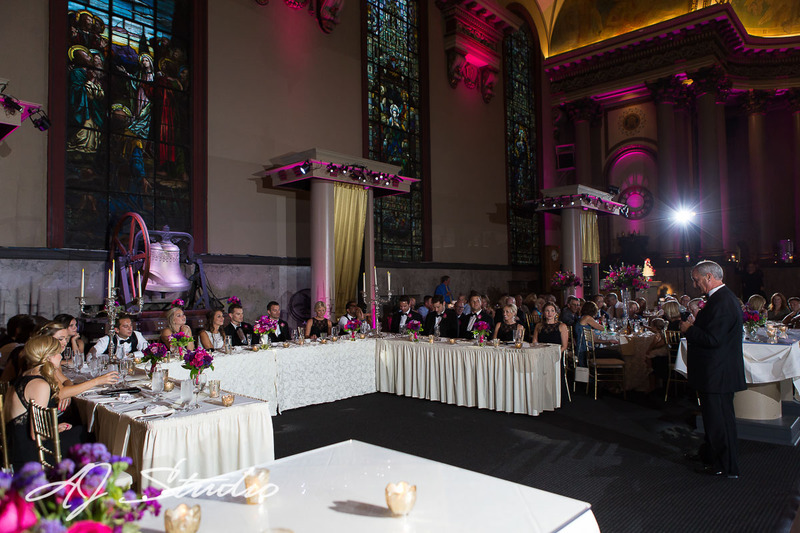 The ceremony and reception spaces are beautifully accented by decor and uplighting for a tastefully luxurious wedding venue with magnificent architecture and design with vaulted ceilings, stained glass windows, original hand-painted murals. The Bell Event Centre’s vaulted ceilings and spacious rooms are just a couple of the reasons I love this wedding venue. As a wedding photographer, I appreciate how easily I can walk around the event space and capture candids of guests enjoying the celebration and experiencing the emotional moments throughout the wedding. The cobblestone courtyard overlooking the city of Cincinnati adds another stunning detail to the already beautiful wedding venue. What is included when a client books your services? Included in the minimum are the following: setup, tear down, tables, house linens, gold chiavari chairs, glassware, china, cake cutting, and a day of coordinator at no additional cost. Also included is access to our beautiful Bride and Groom’s suites 3 hours prior to your event time. How far out should a client pay a deposit to secure your services? We suggest that clients sign a contract and pay a deposit 9-12 months in advance. What makes the Bell Event Centre unique? Our building and our food. Originally built in 1850, the building features vaulted ceilings, priceless stained glass windows, original hand-painted murals, beautiful marble, and terrazzo flooring making it a perfect setting for client’s events. We offer several menus expertly crafted by our Executive Chef, who can also customize your menu to fit your desires. All food is prepared day of, onsite by our expert culinary staff. 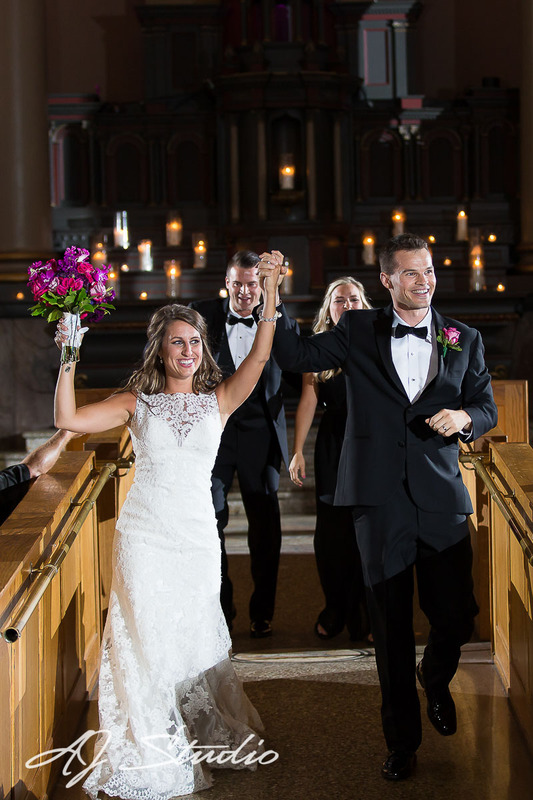 This Cincinnati wedding venue can accommodate up to 300 wedding guests and provides wedding planning services ranging from simple wedding day coordination (included for every event), complete planning and coordination, and a ceremony offsite coordinator for complete peace of mind. Couples can customize their wedding packages and add on any other services like RSVP management, a design package, post-wedding assistance, and even bridal shower coordination. Couples fall in love with this wedding venue for the elegant style and quickly appreciate all the support from the wedding coordination team and the custom wedding packages that allow couples to design their ideal wedding experience. This entry was posted in Wedding venues. Bookmark the permalink.